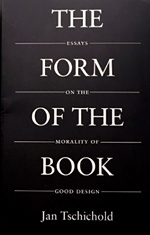 Inspired equally by reading "The Form of the Book" by Jan Tschichold, learning the typesetting language LaTeX and flipping through some beautifully designed children's books from the '70s, I'm moving forward with my long-standing goal of designing a monster book of the actual printed variety. I had put together a layout for the book a few months back and mothballed it. After reading Tschichold's book, I was inspired and ditched my original, cramped layout in favor of a design inspired by the canons of page construction. Since a monster book contains a lot of disparate information (text, tables and images), I decided to limit each monster entry to two-page spreads, with text and tables on the left page and the image on the right. Once this template is finalized, I'll have a consistent (though flexible) grid structure to hang content on. For example, I now know that each monster entry should be 200 - 250 words long to fit within the allotted space. 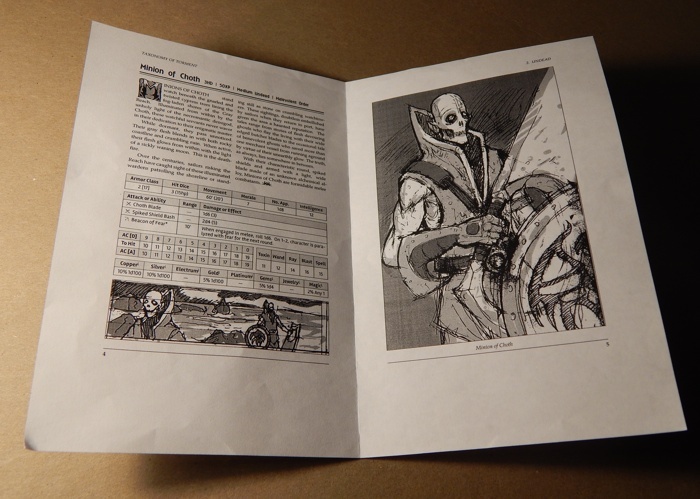 The above image is a half size mock up that I printed out to see how the pages would work in an actual spread. The template is still a work in progress. Here's what's on my drawing table right now. A sinister, fallen angel that is probably the result of too much Baskin, Barker and Black Metal. 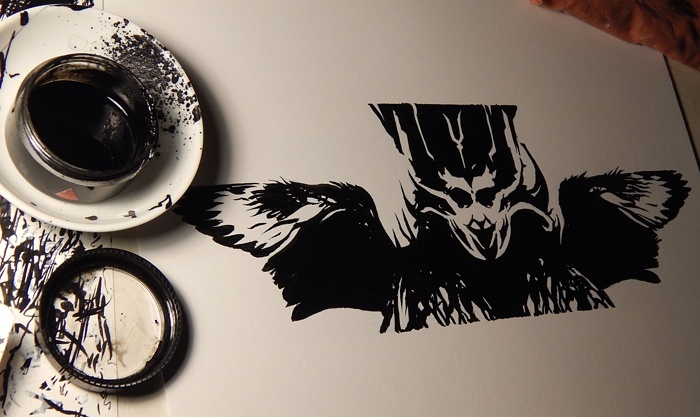 I inked the image with my favorite brush; a Windsor & Newton Sceptre Gold II No. 2 brush purchased last year at Guild Art in Northampton, Massachusetts. I use an open-mouthed, screw top container from my local beauty supply store as an inkwell. I've found that such a container makes it easy to load the brush without getting ink all over the ferrule and ruining the brush. Meet Rakas Torén, a weaponmaster and mercenary from the snowy reaches of the Veiled Peaks. I've played this character for the better part of the last four years in an ongoing Iron Heroes campaign. 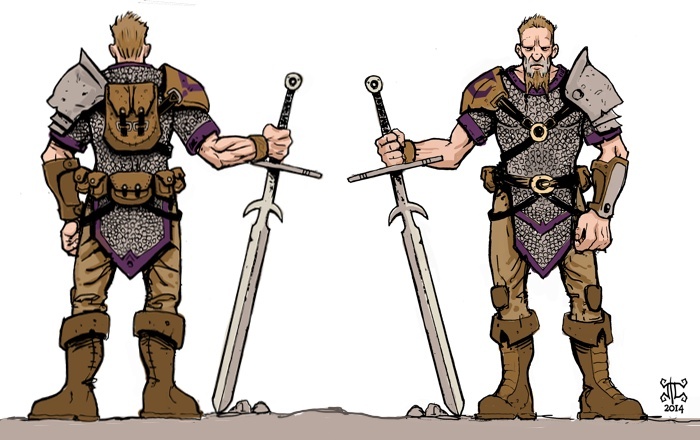 I drew this image of the character so I could have an accurate paper miniature on the table, complete with zweihänder and obstinate scowl. It's interesting how discoveries are often serendipitous. I've long had a fascination with the history of role playing games, and have recently been delving into the history (and prehistory) of the role playing hobby. In the course of my reading, famed "Appendix N" author Fletcher Pratt's 1940's vintage naval war game rules were mentioned several times as being popular and influential in the wargaming scene of the 1960s. Additionally, Pratt's games just sound fascinating; they often occupied the floor of an entire ballroom, with people crouching on the floor sighting their targets and pointing little paper arrows to indicate their intended direction of cannon fire. People running submarines were relegated to another room. I wanted to track down a set of these rules to see what all the fuss was about back in the early '60s when the rules were revived by the wargaming scene of the time (particularly by a couple of Midwesterners by the names of Arneson and Gygax). I don't plan on playing Pratt's naval war game, but I was interested in reading the rules partly out of historical interest and partly to mine for ideas for my own game designs. 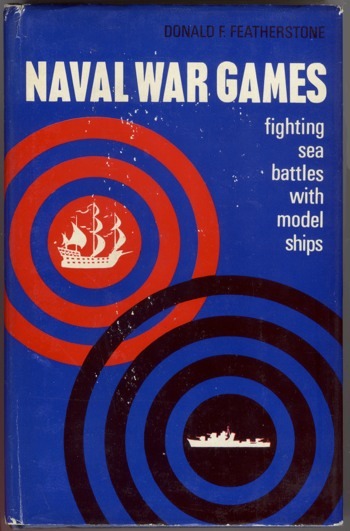 Well, original copies of the rules proved difficult to find, but I came across a book called "Naval War Games" by British author Don Featherstone, which contained a summary and restatement of Pratt's rules, along with a number of other rulesets used to simulate different eras of naval warfare. Well, I ordered the book and it arrived on August 31. Published in 1965, it's a time capsule of an era in gaming I was not around to experience. I did a little more research and found that Mr. Featherstone was 95 years old and had authored dozens of books on wargaming. He was also none too fond of the introduction of fantasy elements into wargaming, which put him at odds with a certain gaming trend of the mid '70s. In fact, in his 1975 book "Skirmish Wargaming," Don refers to a concept in which players assuming the role of a single character on the gaming table as "Individual Wargaming," which given the timing of the book (published one year after Dungeons & Dragons), can't help but seem like a snub to role playing games. In any case, a few days later, I checked the Wikipedia entry to review Featherstone's bibliography, only to find that he had passed away on September 3. Thanks for your contributions to the hobby, Don, even if I was late to the game. Featherstone, Donald F. Naval War Games; Fighting Sea Battles with Model Ships. London: S. Paul, 1965. Print. While in Sweden, I took pictures of interesting architectural details where I found them. These two in particular seem like they'd make good dungeon dressing. This first one is from the fountain in Stortorget, the "Great Square" in Stockholm's Old Town. 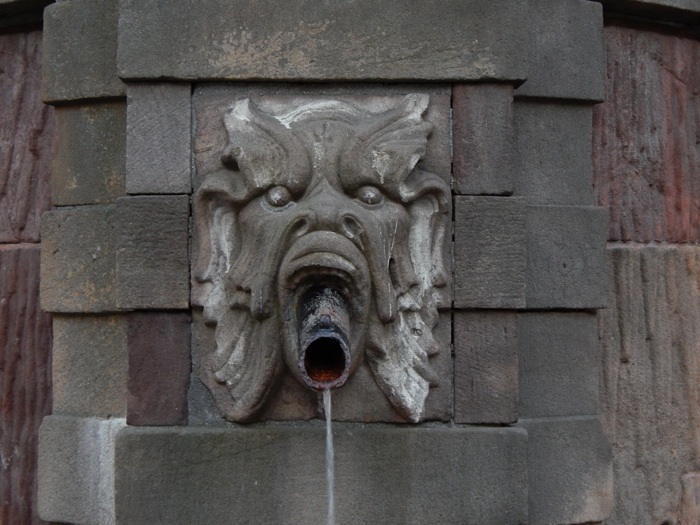 The gruesome face seems particularly well suited to a dungeon environment, especially considering that it sits on the site of the Stockholm Bloodbath, where 80 or so nobles and clergy were executed in November of 1520. I'm guessing the fountain was built later than that, but the sordid history of the square seems to imbue it with a certain sense of morbid menace. 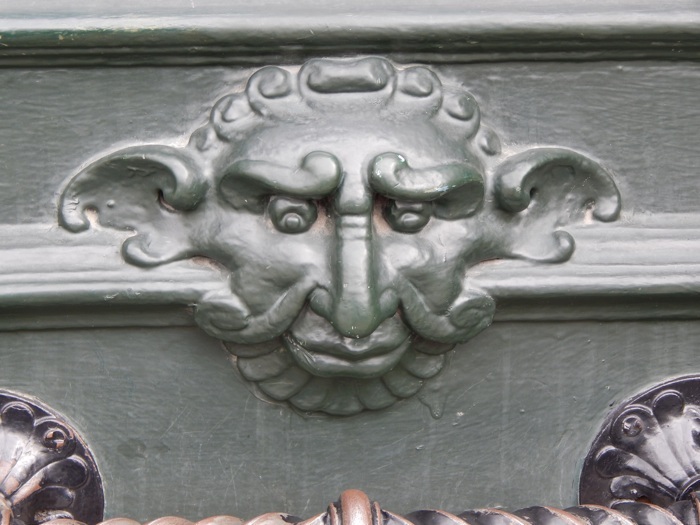 This fellow, on the other hand, looks significantly less menacing than the Stortorget face. Numerous near-identical faces adorn the doors of the Göteborgs Stadsmuseum in Gothenburg (which has an impressive collection of viking artifacts, by the way). The building used to be the headquarters of the Swedish East India Company. For some reason, I expect it to start talking like the door knockers in the movie Labyrinth. I recently spent two weeks in Sweden, travelling around the country. I visited Stockholm, Göteborg and even made a side trip to Kiruna in the far north, where I caught some midnight sun. 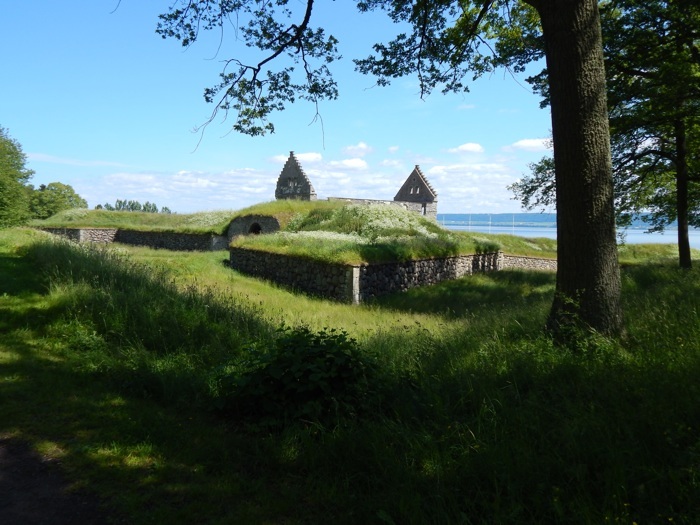 One of my favorite locations, though, was the island of Visingsö, which sits in Lake Vattern not far from Jönköping. The island has a number of ruins and historical sites on it. I can't really resist taking pictures of ruined castles. 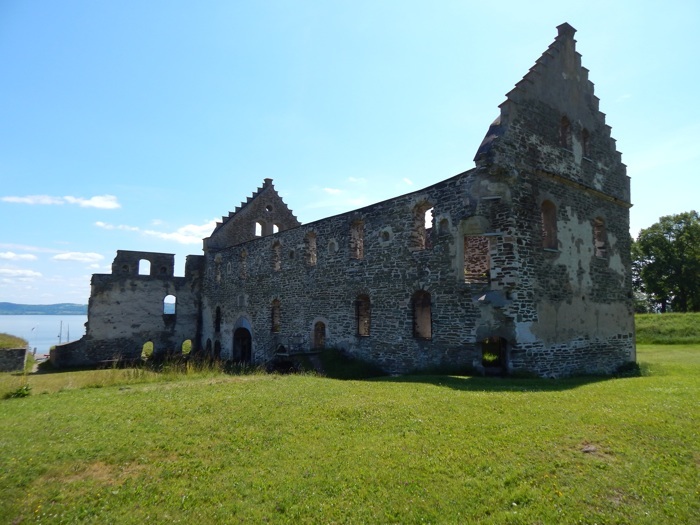 These are pictures of Visingborg, which was built in the 16th century by the Brahe family and gutted by fire in the early 18th. This picture was taken from within the castle walls. Lake Vattern and Gränna are in the background. A view of the castle from outside the wall. † Bite 3d6 -- † Tentacles 2d6 plus special (see below). → Gaze of Doom: (Save: Spells) The gaze of the maloculus instills fear in even the bravest adventurer. Anyone failing a save vs. spells rolls 1d6. On 1-3, the victim cannot attack and will cower for two rounds. On 4-6, the victim will stare blankly and walk towards the maloculus for 1 round. † Tentacle Flail: The tentacles of the maloculus will whip about during combat. Once per encounter, the maloculus can flail its tentacles to reach an opponent that is up to 10' away. At all other times, such attacks are restricted to adjacent foes. Treasure & Possessions: 3d10 gold pieces. 20% chance of alien artifact or magic item. 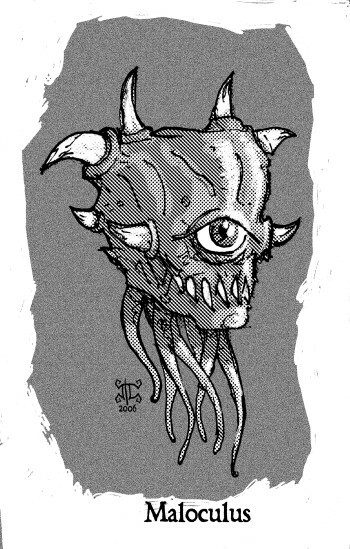 Floating eerily through subterranean caverns and staring out at the world through a single malevolent eye, the voracious maloculus is a truly a terror to behold. Both fiendishly intelligent and borderline insane, it is just as likely to regale adventurers with jovial, self-important tales of its own magnificent deeds as it is to devour them piece by piece. Sometimes it will attempt to do both simultaneously. The origin of the maloculus is lost to history. Some say it is the result of an ancient wizard's attempt to create a myopic dungeon guardian that would keep its single eye focused on the task assigned to it. Others claim that the first maloculus arrived in the world through a rip in the fabric of reality itself from a plane of pure madness. Regardless of its origin, the Death's Head of the Dark is driven by inscrutable motives and a seemingly boundless appetites. Being little more than a floating head, the maloculus has an immense brain that possesses tremendous raw psionic power. Fortunately for all other lifeforms on the planet, this raw mental power is held in check by the creature's bestial appetites, which prevent it from reaching its full potential. The fraction of its mental power that it is capable of harnessing is still enough to make it a tremendous threat. The maloculus spends much of its time in solitude, conversing with only itself for centuries at a time. In the warped mind of the maloculus, this feeds into its megalomania, as it believes its solitude to be a reflection of its singular importance in the world. Each maloculus literally views itself as the center of the world. Even if the adventurers never encounter the creature, the decor of the lair will make it clear that a maloculus lords over it. Everything from tapestries on the walls to the robes or armor of the thralls will be emblazoned with the sigil of the all-seeing eye. (Maloculi are not known for either humility or subtlety). 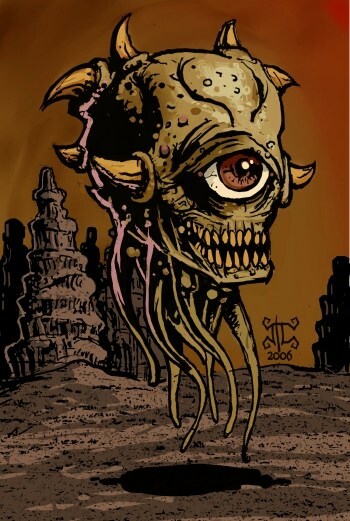 Every maloculus has a distinctive ocular sigil. The creature's tendency to acquire thralls and ostentatious lairs can be used to gradually lead the adventurers towards an encounter with a maloculus. Low-level adventurers could stumble upon clues which lead them to an encounter with maloculus thralls. As the adventurers become more skillful, they can find their way to the main lair and confront the creature itself. Though I enjoy the Warhammer universe (largely thanks to Fantasy Flight's recent RPG), I have zero desire to play either of the large-scale wargames (Fantasy Battle or 40k). It's just way too much commitment in terms of both time and money. I mean, what if I built a huge undead army and then decided I didn't like undead anymore? * Besides, I tend to like tactical gaming the way I like my fantasy fiction - action-packed and to the point. That's why I'll read pulp fantasy like "Kyrik: Warlock Warrior" over "Game of Thrones" any day. A few weeks back, I found a used copy of the Mordheim rulebook at Half Price Books. I had heard of the game before but never seen it or played it. 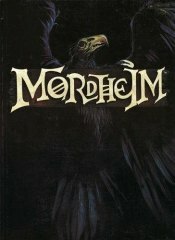 Now the Warhammer universe is a grim, dark place, but Mordheim (now out of print, but available at the Games Workshop website in PDF form) cranks up the volume by throwing an apocalypse into the mix (it's not surprising that the game was published in 1999). A comet thought to be a good omen instead crashes into the city of Mordheim**, devastating it and showering it in radioactive meteorite shards. Apparently, the shards become a valuable resource and people come from all over the world to get their hands on them. Not surprisingly, chaos ensues and treasure hunters fight the flat-out crazy mutant inhabitants in the ruins of the city to accumulate piles of glowing green meteorite shards. I haven't pored through all the rules yet, but at its core, Mordheim is a skirmish minis game. You create a warband of 10-15 minis and then duke it out with other warbands. The game is played as a campaign, and from session to session your intrepid band of cutthroats accumulate radioactive meteorite shards, experience, weapons and powers. One could almost call it a tabletop action RPG. In any case, I've been inspired enough to dig out some Warhammer zombies that have been sitting in my closet and actually assemble and base them. 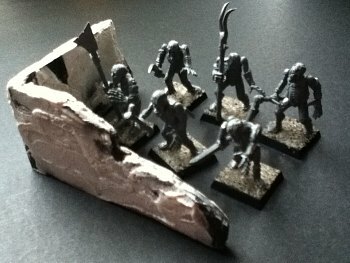 As an experiment in terrain making, I also tried creating a section of broken wall using Foam-Core and spackle. They're currently unpainted, but I'll post updates when I get around to finishing them. *Yeah, right. Like that would happen. **Honestly, what outcome did they expect? They named their city like they were naming a Norwegian black metal band. As a result of a stubborn Movable Type bug, I've disabled commenting for now. I figure no commenting is a better user experience than buggy commenting. In the meantime, look for a new monster entry soon – the vile Maloculus! Here's the original sketch from 2006. A 'remastered' version of this image (which is truly a terror to, um, behold) will be released with the forthcoming monster entry. ♦ When the tines are impaled in the earth, the artifact leeches an arcane substance into the earth that will raise all dead in a 500' radius in 1d4 hours. Inghatrak's Gurgling Skull is a magical totem which is the culmination of centuries of research by Inghatrak, a lich alchemist obsessed with codifying the science behind undeath. Convinced that the source of undeath lay in cosmic radiation from beyond the stars, Inghatrak scoured the land for radioactive meteorites collecting and using them in cadaverous experiments. The final ingredient serendipitously presented itself after Inghatrak emerged victorious in a duel with a long-time enemy whose name has since been forgotten. 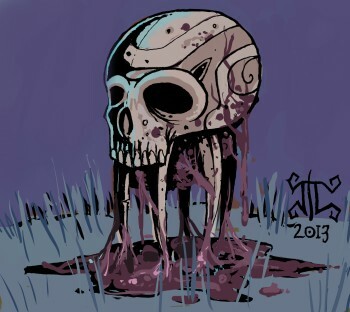 Never one to let material components go to waste, the lich cleaned the skull, discovering that the residue of magical intellect left in the membrane lining the skull, when combined with a particularly toxic meteorite, was the final ingredient needed to predictably reanimate the dead. The artifact itself consists of a decorated, reinforced skull which conceals a reservoir of arcane ooze surrounding a polished meteorite core. Five sharpened tines protrude from the skull which, when planted in the ground serve as a delivery mechanism, leeching a noxious substance directly into the ground. Within a matter of hours, the infectious ooze suffuses the ground in a 500' radius, causing the dead to rise and pursue the living. If not slain, the undead will eventually find their way back to Inghatrak's lair, joining its undead army. © Copyright 2006–2013 Michael Coté, all rights reserved.